ICCL Charter on the Rights of Victims of Crime (June 2008). This short submission focuses on two two main issues: – proportionality and the use of force; – the use of potentially-fatal force in defence of property. Submission by the Irish Council for Civil Liberties (ICCL) to the Oireachtas Joint Committee on Justice, Defence and Equality on the Bail Bill 2015. ICCL Submission to the Oireachtas Joint Committee on Justice, Defence & Equality on the review of Ireland’s approach to possession of limited quantities of certain drugs. We are delighted to launch the 2nd edition of Know-Your-Rights:Criminal Justice and Garda Powers, which was updated in June 2014 to reflect recent changes in Irish criminal law and procedure. This includes significant recent changes in the procedures around access to a lawyer during questioning. 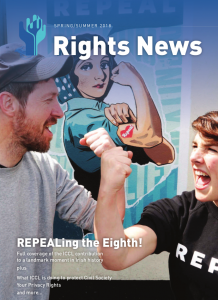 The Know Your Rights Criminal Justice & Garda Powers pack provides the general public with information about their rights and Garda powers in the areas of searches, arrests, interviews, detention, provision / retention of bodily samples and public order. This is the basis of the ICCL’s address to the Oireachtas Justice Committee hearings on reform of the 2005 Garda Act, taking place on 14 May 2014.